I found another fantastic pizza recipe! I have a hard time trying to find pizza night recipes to try because whenever I google "homemade pizza" I get all sorts of dough recipes, and we've established that I am not a dough maker. So then I have to think of the type of pizza I want and google that. Like for this time, I googled "spinach pizza". 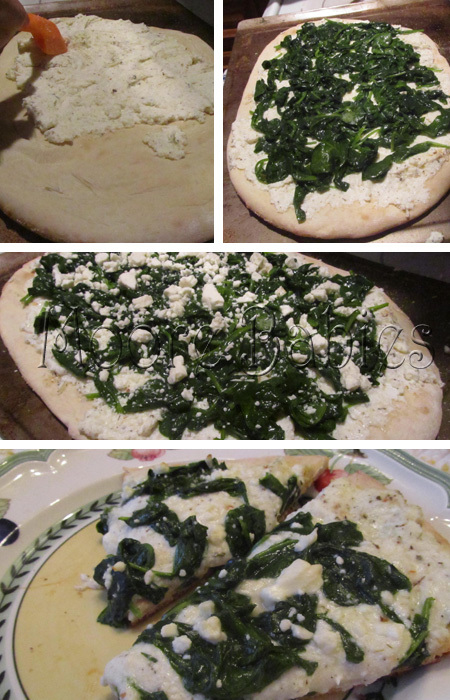 And Voila... up came King Arthur Flour and their Spinach White Pizza Recipe. We kind of goofed for this recipe, because we put ALL the cheese mixture onto ONE pizza.... looking back at the recipe it does say "Our Pizza Crust recipe is great; it make two 14″ pizzas, which is a perfect size for the amount of filling in this recipe." Woops. Hubby and I alway try to figure out how to make whatever recipe better, adding sausage, more or less of stuff etc.... well he says, next time lets try to make the cheese layer thinner, like roll it or something (roll it? Ok hubby), and THEN it dawned on me that the picture I saw showed TWO pizzas. 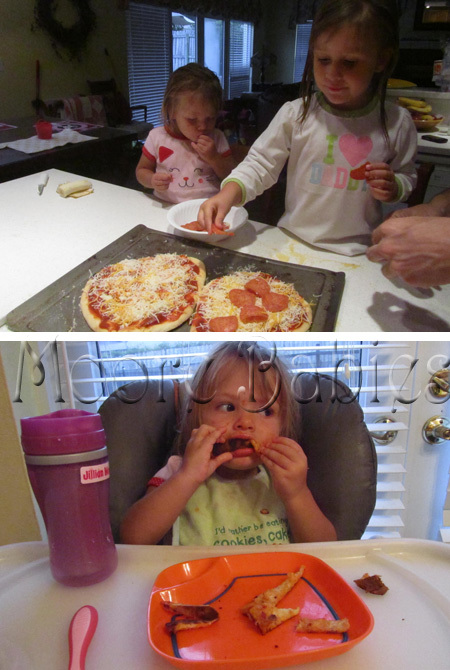 Then just in case the girls didn't like our fancy shmancy white pizza, we did two flatbread pepperoni pizzas. Clearly, Jillie was a fan!